Mark and Manny first met at the Star Wars Celebration Europe in London in 2007 and have been good friends ever since. 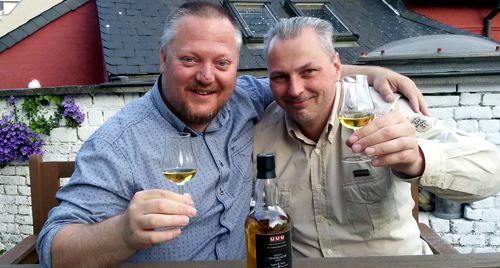 They both started as collectors of all things related to the popular sci-fi saga, but were happily surprised to find out – much later – that they both love whisky too. Since then they are inseparable. A bit like the Beauty and the Beast (we will let you decide who is which) or like Laurel & Hardy (don’t you dare!). Or maybe even like Artoo and Threepio. Anyway, you get the picture. The idea to bottle single cask whisky for lovers around the world was too good to pass up for them. Star Wars and whisky fan for as long as he can remember. Well, not really. He discovered the wonderful world of whisky at the age of 31, but it was not until 2009 that he started seriously studying (so he says) and sipping (yeah, right!) whisky. He has a channel on YouTube where you can watch his so-called Whisky Ramblings. He collects Auchentoshan whisky, for which he was dubbed The Toshan Man. Collects toys, autographs and now artwork and is dealing with the fact that one room might not be enough. His first whisky tasting was in 2009 and he bought a bottle of the local club’s bottling. Since then, all bets are off.